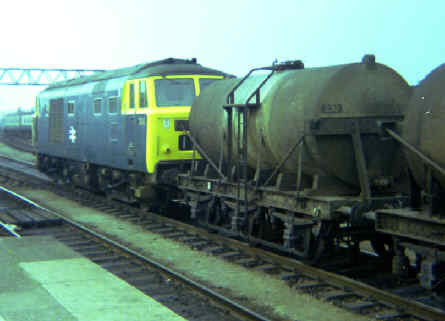 The last class of diesel hydraulics were the Class 35 Beyer Peacock Hymeks such as D7054 seen here at Bristol Bath Road. They were midway between the D63xx's and the Warships in power and could give a good account of them selves on fast passenger turns. 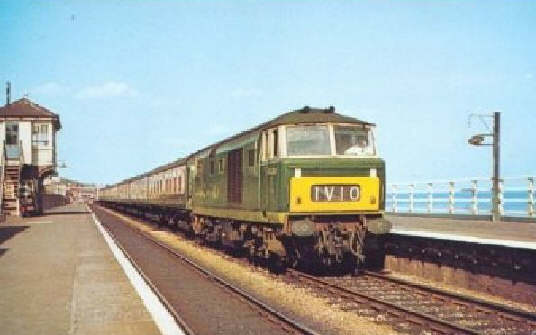 Before the diesel electrics, such as the Classes 45 & 46, worked them many of the holiday trains to Devon and Cornwall were worked west of Bristol by Hymeks but otherwise they were not so common down there, being more often seen in South Wales. 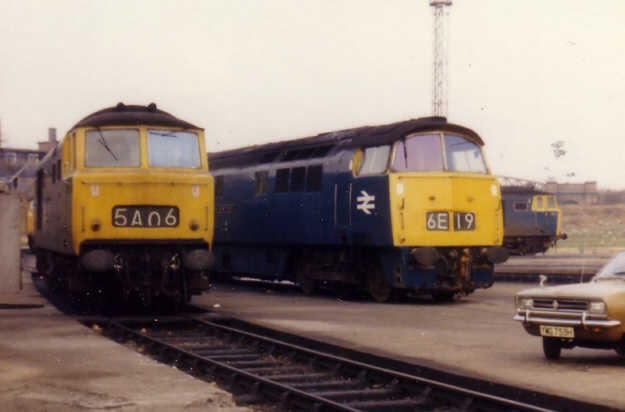 Besides the main subject on the right can be seen the noses of various other locos of Class 45 or 46 and the nose of a Blue Pullman unit. 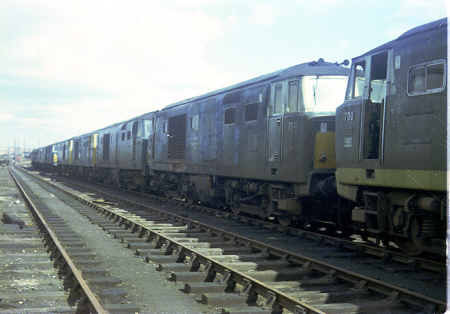 One feature of the Hymeks was their loud and throbbing exhaust when idling, when I worked at Paignton station I found the reverberation in the downside ticket collector's hut to be too painful to stay in it while a Hymek was in the vicinity. Jon Tooke let me have this photo of D7014 on a down holiday train at Dawlish in August 1967, a train that it would have taken over at Bristol, and which was heading either to Torbay or into Cornwall. 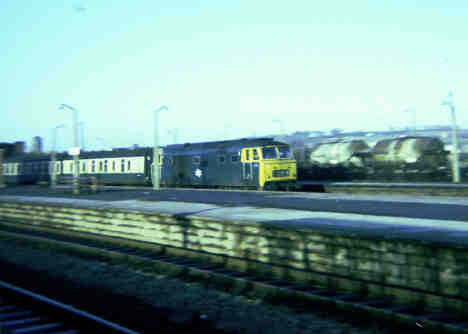 Another Hymek, this time D7092, is seen here passing through Cardiff with a milk train. This traffic, like the locos, has disappeared now, like so many things it now goes by road, but up to the early 70's it was a staple traffic from many parts of the country up to London, this one is from West Wales, but many ran from Devon, Cornwall and Somerset. The tanks being loaded at Totnes was a familiar scene for me as my Aunt lived opposite that part of the station. 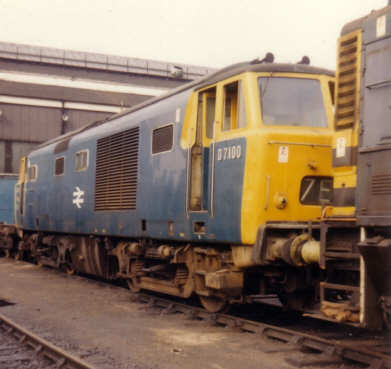 D7017 is seen here at Cardiff with a Portsmouth train, a route they were long associated with, it is now preserved on the West Somerset Railway, there are photos of it there on WSR Summer 2002 and Diesel and Electric Group. 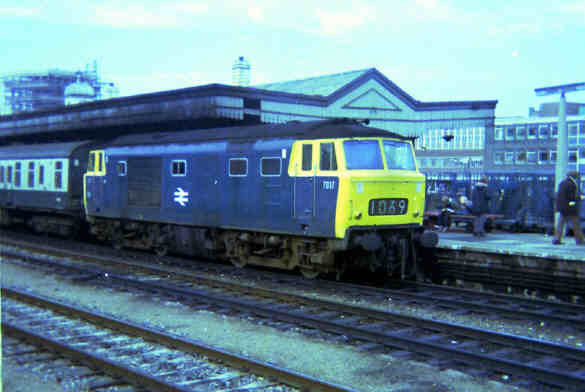 D7016 at Cardiff Canton, at one time the home depot of a large proportion of the class. 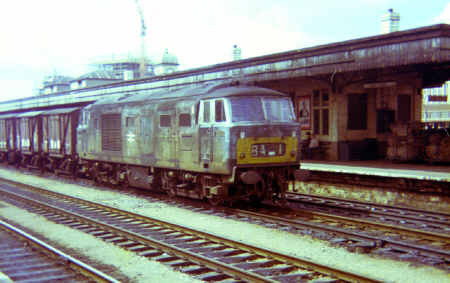 D7052 in appalling external condition on a freight passing through Cardiff General. 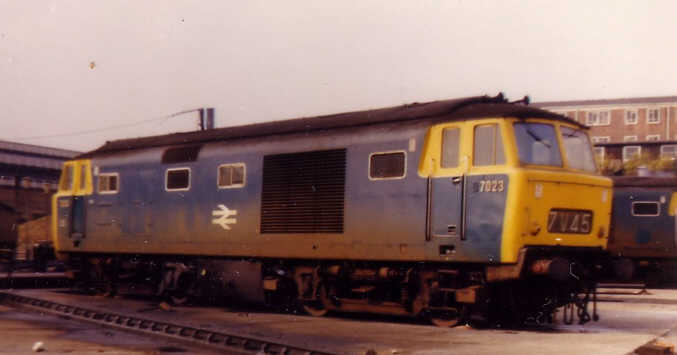 D7047 in a line of withdrawn Hymeks, as with all the hydraulics they were withdrawn early as being non standard. 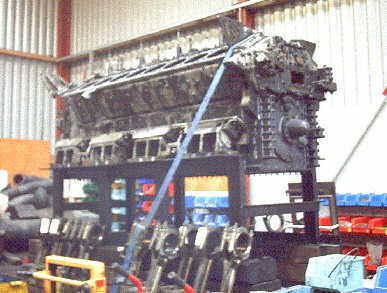 Two photos from Jon Tooke showing the stripped down Maybach MD870 engine from D7018 at the DEPG's Williton Works on the West Somerset Railway where it is undergoing an overhaul after a serious failure some time ago. 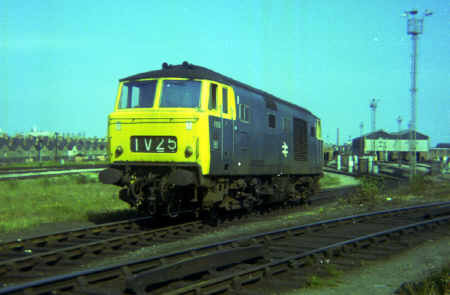 A Hymek passing through Severn Tunnel Junction at speed with a Cardiff - Portsmouth train. 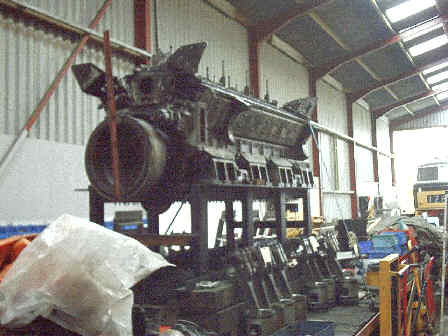 D7023 by a turntable at Old Oak Common starts a few photos by Glen. D7028, D1022 Western Sentinel D7023 again at Old Oak Common. D7029 nose to nose with D1026 Western Centurion. 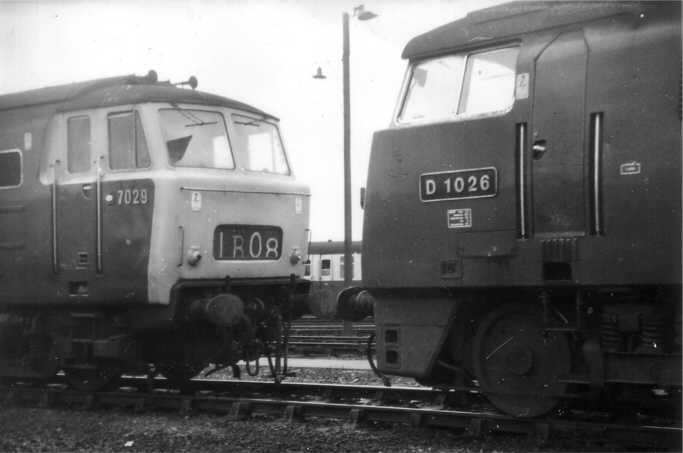 The last of the class, D7100 in the company of an 08 shunter.